TERESA COLLINS : TODAY is the DEBUT of CANON & National Stationery Show for me!!!! TODAY is the DEBUT of CANON & National Stationery Show for me!!!! I can finally share HUGE exciting news. How honored am I that I have been asked to partner with CANON? I would never have thought that my passion for photography and printing and living a CREATIVE LIFE would enable me to work with the highly esteemed CANON company. Yes, you read that right. I now have partnered with CANON and you are going to see many wonderful things ahead with our partnership. I am going to tell you the entire story of our partnership soon. I have always been a CANON girl and if you know me, I always have my CANON camera in my purse- 24/7. I believe in their products and have been the biggest fan for years. Now, I get to work with them. What a HONOR! FOR now... TODAY is the DAY... secret meetings and many plans later you will know that I have and will always be a CANON girl. I could not be more excited to be working with them and I know that it will be a way to further "tell OUR story" and SHARE our MEMORIES more. I feel like the most LUCKY girl in the world. Thank you CANON for your belief and wanting to work with me. This is a view of my BOOTH here. it is office, stationery, gift and home decor. WATCH my Facebook and Instagram page all day for MUCH MORE!!!!!! I am THANKFUL for this DREAM COME TRUE. DEBUTING at the National Stationery Show. and DESIGNING from the HEART!!!! I spy with my little eye...some cool looking stationery...pencils...gold scissors, maybe a gold stapler or hole punch and a bright future with this endeavor. You don't need luck my dear....everything you touch turns to gold!!!! Enjoy the journey! That is just SUPER AWESOME! So happy for Y��U! The booth looks SUPER GORGEOUS!!!! TA DA! A MAGICAL DAY! Booth looks fantastic and looks like the minor problems didn't cause to many problems - it looks great. Will love the see what you and Canon come out with. Had a Canon printer until it finally died - was with me a long time - it was a pixma. Have a great day/week. Wow, you are amazing! Congratulations! YOU and Barbara Walters are helping to pave the way for ALL women to reach for the stars... Congrats , here's to your success! That is so amazing! So happy for you. I know you're dealing with a lot right now. Sending prayers your way. Your booth looks amazing and I love the way it all came together, despite the problems. From what I can see of the pictures so far, I really like the direction you are going and now to have Canon partnered is amazing!!! You will be a huge success in NY! You don't need any luck - you have talent! Hugs to all of you! WooHoo !! this is definitely 'Something Wonderful'. So exicted for you and your partnership with Canon. Beautiful booth. Cannon is amazing news perfect partnership. Neato!!! 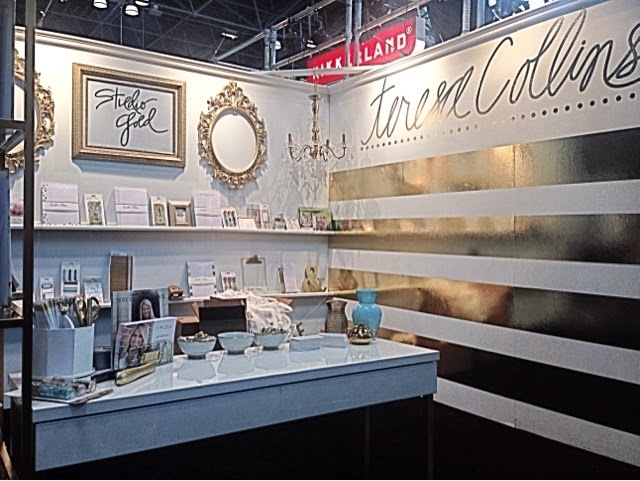 Your booth looks heavenly :) Best of luck Miss T!!!! xoxo! Teresa YOU are such an amazing person and I cannot think of anyone who deserves this success more! You work so hard, you inspire so many, you are strong in your faith and family. I know you truly have a passion for sharing your story which it turns inspires SO many to be the historians of their families! You do all this with such grace and passion and I am so excited for you that you are following your dreams, but I am SO happy that you share it with the world!!! You definitely make the world better by just being who you are. Now the fun part...ack...can't wait to get Studio Gold in my house and at my office! Yippee!!! I wish you LUCK! Although you won't be needing it...with the love of your family and the people you inspire everyday you are a hit girl!! Have fun!! The gold comes from that heart of yours.! How exciting! Look forward to hearing more! What great news. You are always moving forward. Waiting to hear all the news and see all the new products from this partnership. Awesome, can't wait to see what is ahead with Canon. Have a great time at the show! Congratulations! I'm sure the family is so very proud of you! Can't wait to read more details! Your husband must be so proud. I myself am a Nikon girl but I wish you luck with this new partnership. I hope they catch the thieves. I'm sorry you had to go thru that. I'm sure that another vendor stole it. People are such jerks. Good luck wishes sent! I am sure you were a smashing success! WOW! I'm so happy and excited for you! Best of luck to you always!!! heartfelt wishes for the BEST!!!!! This is so beautiful! Congratulations Teresa!!! At Wally Wall Art, you can order unique and customizable wall decals, wall stickers, wall tattoos for any room. We can also utilize your own design to create truly customizable wall decals.